Business Model: This needs to encompass the soundness and logic of your underlying business proposition. Vertical/Industry Strategy: This is your overarching strategy and ability to manage the direct resources, skills and offerings in order to meet the specific needs of individual market segments, including different vertical markets, as defined by the business model. Market Understanding: This is the ability of the business to understand prospective buyers’ wants and needs and to translate these into products and services. Do you have the required degree of vision – and then ‘shape’ or enhance these into your overall offering. To do this effectively, you need to follow the process as depicted below, and review each area individually. What is the potential size of the market, market sectors, likely customers, competition, barriers to entry, risks etc? What market(s) are you looking to address? > Is it one, or several? What are the current trends in these markets? > These need to be assessed! > Do you know what they are? > How can you determine this? What solutions are your likely customers actually looking for? > Have they tried doing something themselves? > Have they looked at anybody else? > What’s forcing them down this road? > Why do they need to do something? What’s your niche market sector? What are or could be your USP’s? > Again, is it one or several? > How can these be defined? Is there viable business in this marketplace for your products or services? Your research will confirm where there are gaps in the market that you could exploit, and where your products and services would be attractive to prospective customers because they would meet both their particular needs and their budget, and would offer a true ‘Value for Money’ solution. > Are these short term, medium term or long term business opportunities? > You would need to identify ‘Quick Win’ business opportunities! > This would need to be assessed. > Forecasting is an art – not to be taken lightly. > Sales is always a ‘numbers’ game. > Who are they, where are they? > What do they actually have? > How successful are they? > Who do they have as clients? > Can you be competitive against them? > What would it take? What are the possible ‘Barriers to Entry’? > Overall Scope, Features, Benefits, Price, USP’s, Added Value Services, VFM! > If any of the above is negative, what can you do to negate this? 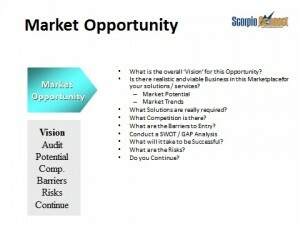 Have you conducted a SWOT / GAP Analysis? What will it take for you to be successful? A recognition by the business to implement the infrastructure and management re-organisation as defined within your Business Case. As with any venture of this type, risks abound. But there is a growing market for reputable products and services where value is being ‘added’ to the opportunity. The key is getting your strategy and organisation right in order to be able to capitalise on this. Do you continue – Yes or No? This is where you assess the risks to the business with regard to this business venture. Are the risks acceptable (given the potential return), or are they too great (with the risk of a loss being too great). 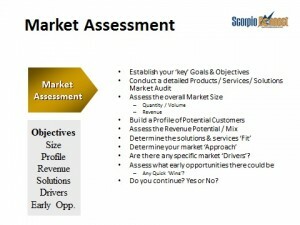 What is your assessment of the market in terms of market sectors, revenue potential and likely early opportunities? You need to clearly establish your ‘key’ goals & objectives. You need to assess the realistic size of the market. You also need to identify the profile of potential customers and determine the ‘fit’ of your products and services. This is to ensure that you focus on strong ‘winnable’ business, rather than trying to be ‘all things to all men’ or trying to be something that you’re not. How should you approach the market? By any means possible – as long as it works, produces the results you’re looking for and is cost effective. What’s the revenue potential? Have you produced a Forecast? What’s the size of the market? How many potential customers could there be? How many could you convert to real customers? This is for you to identify – which in turn will allow you to focus on specifics – rather than just generalities. How can you identify potential early opportunities / ‘quick wins’? As previously mentioned, with any venture of this type, risks abound. Risk needs to be assessed all the way through this process in order to ensure that the business does not take unnecessary risks, but more importantly has these clearly identified so that they can be measured. 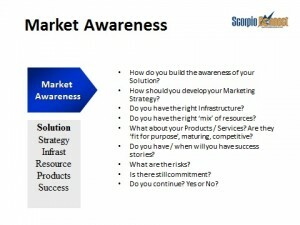 What do you need to do to make the market aware of who you are, what you do and what products and services you offer? There will need to be a significant marketing exposure of the business in order to generate interest in these. This will need to be a combination of general marketing activities, including: Word of Mouth, Referrals, Networking, Personal Contacts, Direct Marketing, Indirect Marketing, Business Directories, Internet, You b Site (and not just your own), Digital marketing, Social Media, Referrals, Testimonials, Case Studies etc. What is your product / services strategy? This will need to be further ‘honed’ in conjunction with this commercial strategy. What infrastructure / resources will you need to deliver this? The business will need the ability to provide the right resources with the right skill sets will be paramount to ensure that the services you provide meet the expectations of customers and will have a ‘knock on’ effect in influencing future customers. Do you have any previous success stories that you can utilise? Some yes – and you need to capitalise on this as success breeds credibility. And this will be a major part of your ability to securing future new business. As previously mentioned, with any venture of this type, risks abound. Risk needs to be assessed all the way through this process in order to ensure that the business does not take unnecessary risks, but more importantly have these clearly identified so that they can be properly and practically measured. This is where you continue to assess the risks to the business with regard to this business venture. Are the risks acceptable (given the potential return), or are they too great (with the risk of a loss being too great). 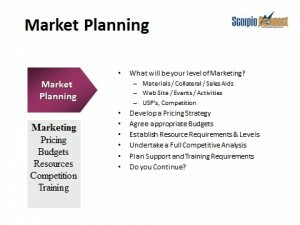 How should the business plan its approach – overall marketing strategy, competition, pricing, targets, resource requirements etc? How should you plan your approach? 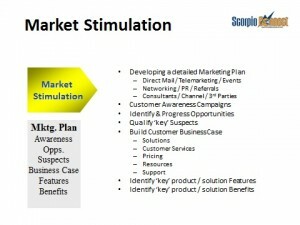 What’s your outline marketing strategy? Have you agreed any marketing budget? Your USP’s need to clearly differentiate you from the competition. They could be any combination of market definition, product features, benefits, price, service – or indeed something else. What materials / collateral / sales aids do you have? Limited (or none). This needs to be addressed, depending on how, where and why they would be used. Or would you use a website (for example) as the principle vehicle with which to address this? What website(s) do you have / can you use / do you need? There is currently your company’s principal website, but this needs to be looked at to see what could be done or could be changed to accommodate what you’re trying to do. It may make sense for your new business to have its own website, either independently or linked from the main website, which would provide both identity and an opportunity to use this as a marketing and sales vehicle, as well as many other areas. Equally – who would manage and develop this? Do you have any activities or events planned? Have you established who the competition is? Of all the market sectors that you are looking to address, you need to undertake a detailed competitor analysis in order to assess what competition there is and what you will be up against. Have you developed a realistic pricing strategy? Have you established resource requirements? Have you all the required support services in place? How should your business generate the leads that will be required – and gain access to good qualified prospects, with particular emphasis on generating profitable business through early / ‘quick wins’? How are you going to generate the leads that will be required to deliver the forecasted business? You will need to gain access to good suspects / prospects, with particular emphasis on generating profitable business through early ‘quick wins’? Creating customer awareness campaigns can be established through a comprehensive range of activities – which could include any combination of direct marketing, telemarketing (cold calls), events, networking, PR, customer referrals, third parties, social media and of course your website. Then it’s about identifying and progressing prospective opportunities, developing ‘Beta’ prospects, identifying ‘Loss lead’ prospects (where appropriate), and building the customer business case with emphasis being on the features and benefits of using your products and services – plus pricing, the ‘value add’, and additional customer services / revenue opportunities.